35 Comments to "South Asians Are Not Descended from Four Populations"
Here’s a news report on this study on the caste system endogamy and how long it has been around. yeah, y they should have done f statistics and such. i know that some of these indian groups are very drifted. i suspect the AAA cluster is an artifact of this…. -Both the “ASI” and “AAA” groups are pretty drifted away from older, more-NW ASI that was absorbed into the ANI populations, so Admixture couldn’t really model the older, more-NW ASI as one or the other. But the CV error is minimized, and while I’m no expert, I haven’t noticed Admixture pulling new components out of drift (eg Kalash) until K is higher than the min CV error. -Maybe there was structure in the hunter-gatherer population, with NW being related but somewhat different than far E or S. Admixture doesn’t know what to do with the NW for lack of less-admixed samples so splits the difference. -Or maybe there is some structure between the hunter-gatherer in “ASI” and “AAA”, but ANI admixed with some of both prior to geographical dispersal to areas where one or the other hunter-gatherer dominated. This strikes me as a stretch. i think it is drift and the fact that they are a mix of ANI/ASI + east asian that has no indo-aryan. i also think ASI structure is a plausible hypothesis. would like to see 4 and 3 pop tests + treemix. y not? -Both the "ASI" and "AAA" groups are pretty drifted away from older, more-NW ASI that was absorbed into the ANI populations, so Admixture couldn't really model the older, more-NW ASI as one or the other. But the CV error is minimized, and while I'm no expert, I haven't noticed Admixture pulling new components out of drift (eg Kalash) until K is higher than the min CV error. -Maybe there was structure in the hunter-gatherer population, with NW being related but somewhat different than far E or S. Admixture doesn't know what to do with the NW for lack of less-admixed samples so splits the difference. -Or maybe there is some structure between the hunter-gatherer in "ASI" and "AAA", but ANI admixed with some of both prior to geographical dispersal to areas where one or the other hunter-gatherer dominated. This strikes me as a stretch. As I read the OP it seems to contradict the title, “South Asians Are Not Descended from Four Populations”. Surely, mainland residents of India do have ANI, ASI, Austro-Asiatic and Tibeto-Burman ancestors. Those populations may not be precisely those identified in Admixture, and may actually be present in different proportions, but I don’t think anyone has ever really doubted that proposition even in the original Reich paper which simply didn’t fixate on the potential AA and TB contributions – the former being a minor part of most Indian people’s ancestry, and the latter being geographically confined to a quite localized part of the country in the NE for the most part. The case that the ASI-Onge distinction is largely a statistical artifact in this case, and that the admixture percentages produced by Admixture are misleading are still valid, of course. 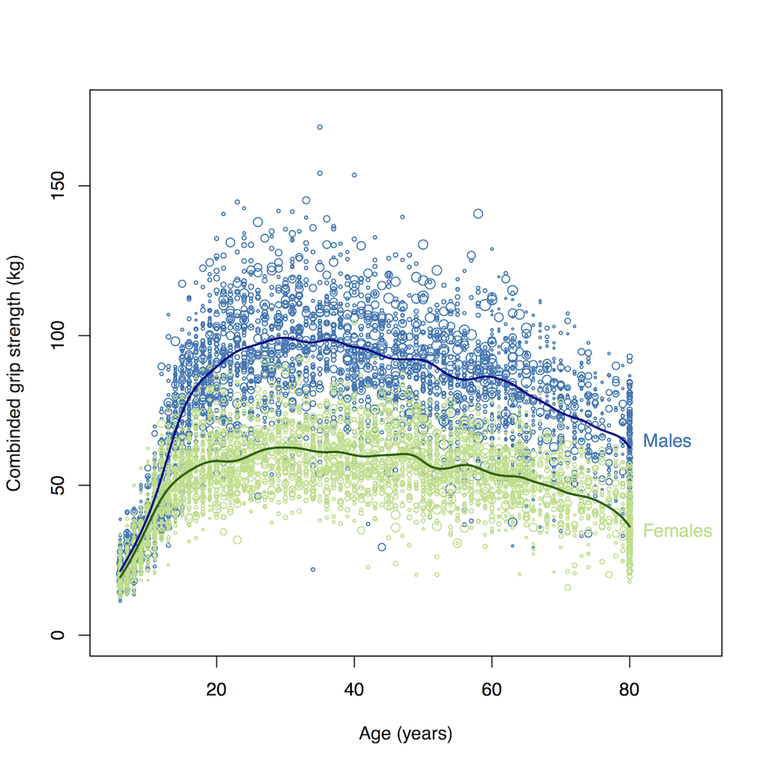 It would be particularly helpful to see f4 and D statistics and TreeMix analysis of this point. I’m also a bit surprised that there isn’t some small and fairly recent Austronesian component, although the sampling strategy of what is probably a geographically limited component would be missed. I wonder if 23andMe will release South Asian summary statistics to see if the more high coverage studies are confirmed by larger but shallower data sets. This would be really helpful information even if it isn’t a statistically random sampling and would thus be subject to bias (something not entirely absent from the existing samples as you note in several instances). One point I thought that you might make very explicitly, given the title, but didn’t, is that ANI (prior to historic era contributions) is itself probably the product of multiple layers. At a minimum: (1) a pre-Neolithic Indus Valley and Northern Indian hunter-gatherer component (this probably had a gradual N-S cline), (2) a Neolithic revolution sourced West Asian component that gave rise to a distinctive relatively isolated Harappan layer originally in the IVC which migrated to the Ganges when the Saravasti River dried up (perhaps the CHG affinities), and (3) an Indo-Aryan component which should resemble steppe populations (which you note). There might also be in ANI a widespread historic era Islamic expansion component and a widespread historical era colonial period component. In addition, there might be some isolated communities (e.g. the Parsi community) as a result of particular isolated historic era migrations to particular areas. Another odd methodological point about the paper is that it uses a very short 22.5 year generation to date the strengthening of caste endogamy. The standard assumption of a 29 year generation would imply a date of 15 BCE instead, which is an excellent fit for the composition of the Manusmriti (there is an accent in there that I don’t know how to type beneath the letter “r”), which dates to 200 BCE to 200 CE, and is very pertinent since is one of the earliest clear codifications of the four tier varna system and other details of caste in practice. Written codification of rules related to caste would coincide perfectly with a sudden ossification of caste endogamy at the same time. This would precede the earliest Gupta kings by about 300 years and there is really nothing in the Gupta empire that screams out for a major change in caste practices. If anything, the fact that a warrior caste rather than Brahmin caste dynasty could rule India was considered somewhat scandalous at the time. Ideas can be more powerful than unified political power in the cultural sphere. I agree that it is a pity that this study didn’t include 1000 Genomes. It has 13 tribal populations (including outliers is important in this work but they make up such a small percentage of the total) and 6 high caste populations, with only one population in between, a gap that could have been filled in part by including prior 1000 Genomes and/or Reich data. It seems that tribal status in India does not correspond very close to autochronous as various negrito populations of Asia seem to. It would be interesting to hear your insight on the population histories of these peoples in South Asia. Ideally, a more ambitious study would have also juxtaposed this results with the abundant available uniparental data for many of the same geographic areas and with more linguistic and archaeological and historical context. This is why armchair wikipedia research has the reputation it does. You throw around fancy terms like manusmriti to give the impression you know what you're talking about. Those who know even less than you about Indian history might be wowed. But I'm not. Brahmins were NEVER considered the natural ruling caste. They were the highest caste, but they were meant to be priests and scholars. The rulers, even in the manusmriti which you mention, were supposed to come from the second-ranked caste, the Kshatriya. If you lack the knowledge of even this basic element of Indian culture, which even an illiterate peasant in India would know, one has to wonder how seriously one should take your pontifications. I don’t think genomes1000 have any information on caste of people who gave samples. pretty easy to map individuals’ whose castes you know onto the 1000 genomes and figure things out. e.g., i know which individuals are s indian brahmins. they are just like the ones i have in my personal data set. probably genetically the same. all s. indian brahmins are pretty similar, though subtle regional differences. This is a rather pedestrian question – but can someone tell me which group it is that is labeled “BIR”? Man am I having a hard time deciphering their labels. This is a rather pedestrian question - but can someone tell me which group it is that is labeled "BIR"? Man am I having a hard time deciphering their labels. KSH – Khatri Sikh ? GBR = Guj Brahmin ? the paper is open access. click the link for god's sake. “Schizophrenia risk from complex variation of complement component 4” ? please ask this sort of thing on open thread. i will have to read the paper soon...it's a big deal though. KSH - Khatri Sikh ? the paper is open access. click the link for god’s sake. Yah, I didn't notice that at first and was looking through the SIs only. My bad. Rec1man - table 1 in the paper has the labels. Yah, I didn’t notice that at first and was looking through the SIs only. My bad. Rec1man – table 1 in the paper has the labels. "Schizophrenia risk from complex variation of complement component 4" ? please ask this sort of thing on open thread. i will have to read the paper soon…it’s a big deal though. As I read the OP it seems to contradict the title, "South Asians Are Not Descended from Four Populations". Surely, mainland residents of India do have ANI, ASI, Austro-Asiatic and Tibeto-Burman ancestors. Those populations may not be precisely those identified in Admixture, and may actually be present in different proportions, but I don't think anyone has ever really doubted that proposition even in the original Reich paper which simply didn't fixate on the potential AA and TB contributions - the former being a minor part of most Indian people's ancestry, and the latter being geographically confined to a quite localized part of the country in the NE for the most part. I'm also a bit surprised that there isn't some small and fairly recent Austronesian component, although the sampling strategy of what is probably a geographically limited component would be missed. I wonder if 23andMe will release South Asian summary statistics to see if the more high coverage studies are confirmed by larger but shallower data sets. This would be really helpful information even if it isn't a statistically random sampling and would thus be subject to bias (something not entirely absent from the existing samples as you note in several instances). One point I thought that you might make very explicitly, given the title, but didn't, is that ANI (prior to historic era contributions) is itself probably the product of multiple layers. At a minimum: (1) a pre-Neolithic Indus Valley and Northern Indian hunter-gatherer component (this probably had a gradual N-S cline), (2) a Neolithic revolution sourced West Asian component that gave rise to a distinctive relatively isolated Harappan layer originally in the IVC which migrated to the Ganges when the Saravasti River dried up (perhaps the CHG affinities), and (3) an Indo-Aryan component which should resemble steppe populations (which you note). There might also be in ANI a widespread historic era Islamic expansion component and a widespread historical era colonial period component. In addition, there might be some isolated communities (e.g. the Parsi community) as a result of particular isolated historic era migrations to particular areas. Another odd methodological point about the paper is that it uses a very short 22.5 year generation to date the strengthening of caste endogamy. The standard assumption of a 29 year generation would imply a date of 15 BCE instead, which is an excellent fit for the composition of the Manusmriti (there is an accent in there that I don't know how to type beneath the letter "r"), which dates to 200 BCE to 200 CE, and is very pertinent since is one of the earliest clear codifications of the four tier varna system and other details of caste in practice. Written codification of rules related to caste would coincide perfectly with a sudden ossification of caste endogamy at the same time. This would precede the earliest Gupta kings by about 300 years and there is really nothing in the Gupta empire that screams out for a major change in caste practices. If anything, the fact that a warrior caste rather than Brahmin caste dynasty could rule India was considered somewhat scandalous at the time. Ideas can be more powerful than unified political power in the cultural sphere. I agree that it is a pity that this study didn't include 1000 Genomes. 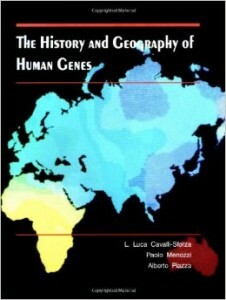 It has 13 tribal populations (including outliers is important in this work but they make up such a small percentage of the total) and 6 high caste populations, with only one population in between, a gap that could have been filled in part by including prior 1000 Genomes and/or Reich data. This is why armchair wikipedia research has the reputation it does. You throw around fancy terms like manusmriti to give the impression you know what you’re talking about. Those who know even less than you about Indian history might be wowed. But I’m not. The point is more that the Manusmriti is where a hereditary caste system is first codified.
" Brahmins were NEVER considered the natural ruling caste. They were the highest caste, but they were meant to be priests and scholars. The rulers, even in the manusmriti which you mention, were supposed to come from the second-ranked caste, the Kshatriya." Traditionally Brahmins were/are the highest caste but there was an article I read some years back referenching a pre-modern comment from Kshatriya stating that they were originally the highest caste but Brahmins with their scheming upended them. I do not have the link handy right now. It does make sense when you consider that Indo-European groups were warlike and the warrior was extolled. In the Rig Veda the Indo-Aryan society was raiding and fighting each other and others. Tribal Pashtuns are known for tribal infighting . Outside of the SubContinent, IE tribes were also militaristic and took over non IE cultures (Minoans, Hattians, elite of the Mitanni kingdom, Elamites being dominated). In these other IE cultures, there isn't a dominant priestly elite that towers over the Warrior nobility. Which is why I think the article I read about the Kshatriya originally being the highest caste is accurate. The analysis in this paper does leave something to be desired and I am surprised that the reviewers did not insist on the authors doing a more thorough job. Perhaps since this is from a third world country these was “the soft bigotry of low expectations”. Nevertheless, I agree, along with ohwilleke, that the authors are right about four or more ancestral sources for South Asians. In particular, the authors are probably correct that the Austro-Asiatic influence is quite pervasive and that almost all South Asians have some of this kind of ancestry. Even as far back as 2001 O2a-M95, which is characteristic of Austro-Asiatics was found in low frequency in low and middle caste populations in South India – see Table 1 in the following paper. The Tibeto-Burman influence is however restricted to the North and Northeast. the research i've seen suggest that AA groups are a compound between an ANI (pre-indo-aryan)/ASI group, and an east asian group (which may have picked up austro-melanesian in SE asia?). IOW, it is like saying ANI-ASI is an ancestral population. no, it's a compound. mind you, ANI itself is something of a compound between basal eurasian, WHG-like, and for indo-aryan part ANE-like. but in the context of india i take saying a group is a "founding population" to mean that >5 K it was found in unadmixed form. or at least when it entered india. this is so for tibeto-burman (who contribute clearly to bengalis), ANI and ASI. but the AAA group is a feature of the indian landscape, though yes, i agree it must have been admixed later into the indian population to some extent.
" KSH = Khatri = 97% ANI "
That is a very high ANI % , what is the source? The articles I read on ANI % says Kashmiris have the highest ANI % , around 75 % . the research i’ve seen suggest that AA groups are a compound between an ANI (pre-indo-aryan)/ASI group, and an east asian group (which may have picked up austro-melanesian in SE asia?). IOW, it is like saying ANI-ASI is an ancestral population. no, it’s a compound. mind you, ANI itself is something of a compound between basal eurasian, WHG-like, and for indo-aryan part ANE-like. but in the context of india i take saying a group is a “founding population” to mean that >5 K it was found in unadmixed form. or at least when it entered india. this is so for tibeto-burman (who contribute clearly to bengalis), ANI and ASI. but the AAA group is a feature of the indian landscape, though yes, i agree it must have been admixed later into the indian population to some extent. Do you think a deeper, more widespread layer of East Asian admixture is plausible, even if it's not specific to AA? Do you think a deeper, more widespread layer of East Asian admixture is plausible, even if it’s not specific to AA? if it is > 10,000 years ago, no. 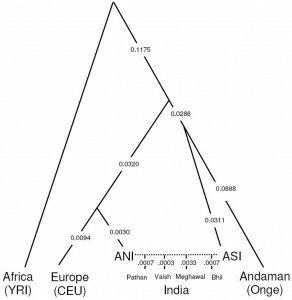 on the PCA the "ASI-cline" moves toward e. asians, until you put a group like andaman islanders there. it's obviously not east asian, just MORE east asian than west eurasian. the contrast here is with bengalis and assamese, two indo-aryan groups who have LOTS of east asian and it jumps out at you. if it is > 10,000 years ago, no. on the PCA the “ASI-cline” moves toward e. asians, until you put a group like andaman islanders there. it’s obviously not east asian, just MORE east asian than west eurasian. the contrast here is with bengalis and assamese, two indo-aryan groups who have LOTS of east asian and it jumps out at you. pretty easy to map individuals' whose castes you know onto the 1000 genomes and figure things out. e.g., i know which individuals are s indian brahmins. 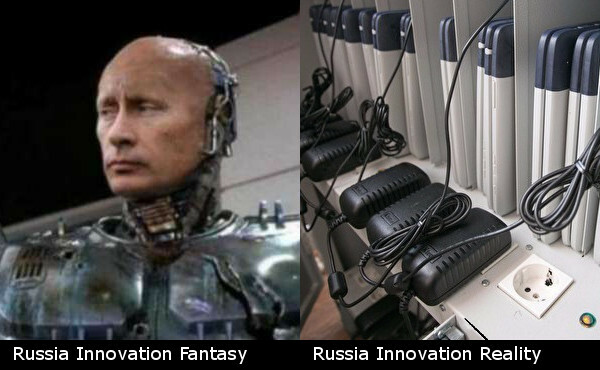 they are just like the ones i have in my personal data set. We can see this also from the following plot generated by Davidski. 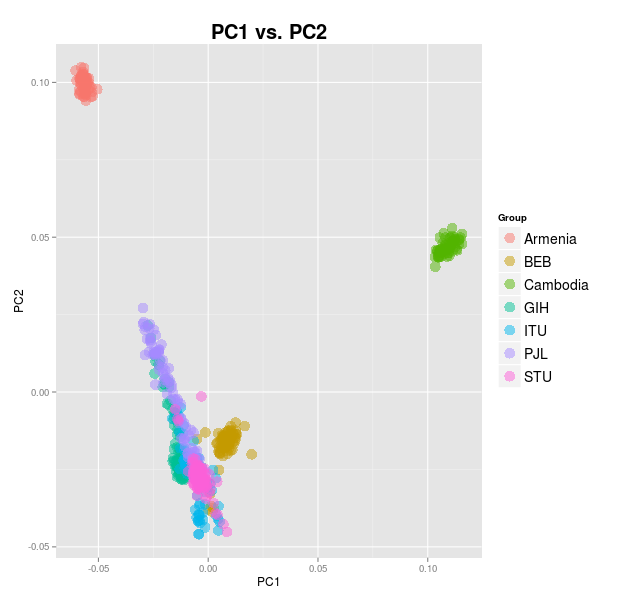 This plot shows that Austroasiatics have less ANI than Paniya who according to Moorjani et al. have only 17%. What this suggests is that Austroasiatics arrived in what is now India before ANI did (ANI was in what is now Pakistan at least 9000 years ago and probably even earlier). This must have been more than 4000 years ago since the ANI admixture date for Vysya of Andhra Pradesh is 4200 years according to Moorjani et al. The Austroasiatics must have been able to spread into India from the East because they had some neolithic agricultural technology (rice). Just like EEF in Europe coexisted and gradually admixed with WHG in Europe, Austroasiatics must have done the same with ASI in India. After the arrival of ANI, Austroasiatics became marginalized. Perhaps there is indeed something to the “Para-Munda” hypothesis for influences on Sanskrit and Ma Ganga is truly cognate to Mekong. It does make sense when you consider that Indo-European groups were warlike and the warrior was extolled. In the Rig Veda the Indo-Aryan society was raiding and fighting each other and others. Tribal Pashtuns are known for tribal infighting . Outside of the SubContinent, IE tribes were also militaristic and took over non IE cultures (Minoans, Hattians, elite of the Mitanni kingdom, Elamites being dominated). In these other IE cultures, there isn’t a dominant priestly elite that towers over the Warrior nobility. Which is why I think the article I read about the Kshatriya originally being the highest caste is accurate. Has the Reich labs made any comments on the Vedda people , on their relation to ASI? They are only found as a distinct group in Sri Lanka but their ancestry would be present in the India SubContinent. Accepted as the aboriginal people of Sri Lanka , their ancestry has to be one of the oldest in the SubContinent. Vedda speech is often described as a creole burrowing from Tamil and Sinhalese , mostly the later. Vedda language has distinct sounds , grammer and vocabularly that sets it apart from Sinhalese. 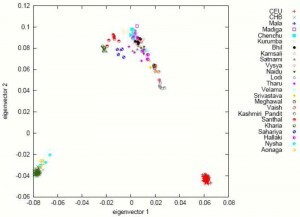 It's from this new paper, and what they actually mean is "Khatri ADMIXTURE result is 97% component we label ANI". It's not comparable to Reich's ANI estimates - those were produced using formal mixture tests, which ADMIXTURE is not. It’s from this new paper, and what they actually mean is “Khatri ADMIXTURE result is 97% component we label ANI”. It’s not comparable to Reich’s ANI estimates – those were produced using formal mixture tests, which ADMIXTURE is not. This 2013 post from Dienekes refrences the 2013 Moorjani et al. paper on ANI % amongst various castes . The 2 Kshatriya groups -fromUttar Pradesh- come in at 54.6% and 60.9% . The Pathan group has the highest ANI at 70%. Looking at the 2016 Basu et al. paper, they have Iyer listed as Dravidian but they are a Brahmin group , which is Dravidian speaking but not Dravidian per se, though obviously they have admixture from the non Brahmin Dravidian speakers. They sampled lower caste and tribal Dravidian groups but not the traditionally dominant Dravidian castes that made up the royalty and merchants.